This scroll opens with an elaborate depiction of the Signs of the Zodiac, a recurrent motif in decorated megillot. According to a midrash, when Haman plotted to destroy the Jewish nation, he consulted the zodiac to determine an auspicious time to carry out his scheme. He decided that the month of Adar, which corresponds with the sign of Pisces (fish), would be the best time because Haman would be able to devour and destroy the Jews just as big fish swallow small ones. God, however, was infuriated by Haman and thwarted his plans, stating “Fish sometimes swallow their prey, but they too can be swallowed” (Esther Rabbah 7:11). the role that Pisces/Adar played in the Purim story. He depicted the fish as larger in scale than the other signs, and placed them outside the circle, next to the signs that precede it, Capricorn and Aquarius. 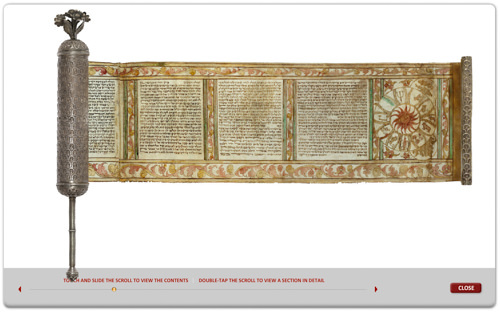 The decorative border above and below this panel ex- tends as continuous bands throughout the megillah, with similar designs framing the sides of each text column. 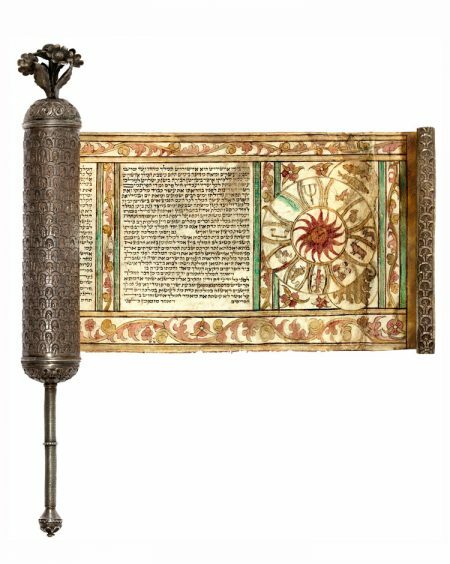 This type of scroll is known as a ha-melekh scroll because most of the columns begin with the word ha-melekh (the king) as a result of a deliberate ar- rangement of the text. In the book of Esther, this appellation refers to King Ahasuerus. Rabbis suggest- ed, however, that emphasis be placed on the word ha-melekh as an allusion to God, the King of Kings, whose name is not mentioned explicitly in the scroll. Rabbinic commentary further elucidated that the absence of the Divine name parallels the theme of the concealment of identity within the story. The scribe’s placement of the word “king” at the head of the columns serves to highlight Divine presence and the overall role that God played in the Purim narrative. The silver case is ornamented with a fish-scale pattern and is surmounted by a stylized cluster of flowers and leaves. Similar silver floral bouquets embellish the tops of many Esther scroll cases from the Ottoman Empire and can also be found on Torah finials and other Judaica metalwork. selected literature Erlanger 2000; Fishof 2001.